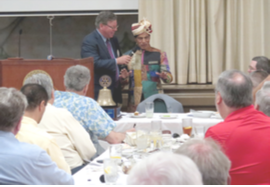 STEVE DAVIS and his travelling companion, our much honored District Governor MANZOOR MASSEY, presented a splendid program about their Rotary travel trip to India. Having made many, many trips to his birth country, MANZOOR proved to be the right leader to guide 6 Rotarians through a “partial visit to Rotarians and their club projects” in a vast land of one of the globe’s largest countries. Through illustrations, re ection, observation and analysis the duo held our club in the palm of their hands. And, just when we think our Club is the ne plus ultra of our District, there comes revelations about Clubs in India who raise funds in the tens of thousands of dollars, operate hospitals, schools, cultural centers, and etc. Rotarians in India are involved through the clubs in “every slice of life.” They utilize partnerships between the non-profit sector, business, and government. And, one of the districts STEVE visited is where the second highest donors to Rotary in the world live. The hospitality and warmth extended to STEVE and the group is evidenced by stories of great kindness and open hearts. 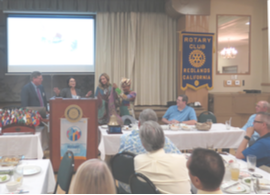 The photographs employed made the talk also an appealing travel log and made all present appreciative of Rotary’s international programs. The emphasis on service by the India clubs came through loud and strong. We welcome, San Bernardino County Supervisor and Ontario Airport Board Member, CURT HAGMAN, as our speaker. We look forward eagerly to an update about this important service and economic entity in our region. Your editor is so old that he remembers taking direct ights to the east coast, Hawaii, and to cities throughout America. It looks like those “good ‘ole days’ are about to come back! The speaker and subject are a mystery at this point. Nevertheless, the programs have been quite good and we are sure your will be pleased. June 9 is the date and already 20,000 hits on Facebook indicate a growing interest and appreciation of this event. Club volunteers are always needed. Do what you can and encourage people you know to bring others to this unique event. who volunteered, donated, sold tickets, worked the doors and the oors, secured the wine and beer and music, and found a perfect location. A huge shout out to RON JEFFREY for bringing sound baf es that absolutely transformed the experience at the beautiful Esri space. The food: excellent. The wines: excellent. The beer: excellent. The guests: diverse, fun, and high spirited. LEROY HANSBERGER: when you and CHUCK ZIILCH began this event many years ago we hope it continues to bring you joy and satisfaction as we add to our scholarship funds! Anyone who has been president of Rotary understands that one of the most important positions on your team is the “Program Chair.” In fact, each incoming president is fearful that the membership will miss meetings because the program is just not that interesting. For six months before I took of ce I was constantly thinking about programs for our club. I really had no idea how this was going to be pulled off. Thank God for DENNIS HANSBERGER, who agreed to step into the Program Chair position. DENNIS assembled a committee including STAN WEISSER, NEIL WANER, BILL HATFIELD, LARRY BURGESS, and BEVERLY NOERR. Together with this group DENNIS brought us great speakers week after week. In fact, many of you may not realize this, but this year we only had one Thursday without a meeting. That means that by the time my term is over, DENNIS will have provided this club with 51 speakers and entertainers. This is a HUGE ACCOMPLISHMENT. DENNIS has shown his commitment to our club by being a tough taskmaster. He screens each speaker before extending an invitation to our group. The focus is to make sure that we have informative presentations that are not self-promoting. Mr. HANSBERGER also continues to keep me on point by suggesting that I limit the time I spend on announcements/ nes so that our speakers have adequate time. Thus far I can remember at least two scolding’s. I want to thank DENNIS HANSBERGER for all he has done for me this year and his commitment to the Rotary Club of Redlands. He continues to carry on the proud tradition that LEROY began. Although I hear that LEROY still keeps him in line.